Garlic mustard is a wild, highly invasive green that is wonderful to cook with – and as the name says, it has a garlicky mustard flavor! Used for perhaps 6,000 years, garlic mustard is one of the oldest European cooking spices. It was introduced to North America in the mid-1800’s, and due to a predator-free environment, it has become highly invasive. Moist forests and floodplains mark its preferred habitat where it is often the dominant plant and can form large homogeneous stands. It produces a variety of chemicals that suppress the growth of other plants and fend off herbivores, so be cautious not to consume excessively large quantities (think grazing cow quantities). In human sized portions, garlic mustard is highly nutritious and offers anti-inflammatory and antimicrobial benefits. 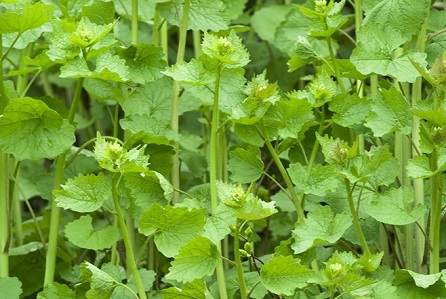 Recently, garlic mustard has received ample attention as a foraged food, and recipes abound. The tiny sprouts that burst up in early spring are mild and can be featured in salads and other dishes. The leaf rosettes are tender most of the spring, but will toughen and bitter as the season passes. You can also enjoy the flower stalks, adorned with the delicate clusters of white flowers. The thin triangle shaped leaves are tender, and for those of you who like a garlicky mustard bite, try them! Even the seeds can be dried and stored. Just pop them in a jar, and use for salad dressings or hot mustard anytime. Lastly, grate the roots into a horseradish-like accent – be sure to add a splash of vinegar! Saute chopped ramps or onion in the olive oil over medium heat until translucent, 4 minutes. Add garlic and chopped mushrooms, cook until the mushrooms release their juices and it evaporates, about 5 more minutes. Toss in 2 cups of the garlic mustard leaves and cover the pan, cook 2 more minutes to wilt the leaves. Remove from the heat and allow the mixture to cool. Put the cooked onion, mushroom and garlic mustard mixture into a food processor, and pulse a few times to mix. Add the remaining 1/2 cup of raw garlic mustard leaves, the farmer’s cheese, sour cream and salt, and continue to pulse until the mixture is finely chopped. Taste and adjust salt. 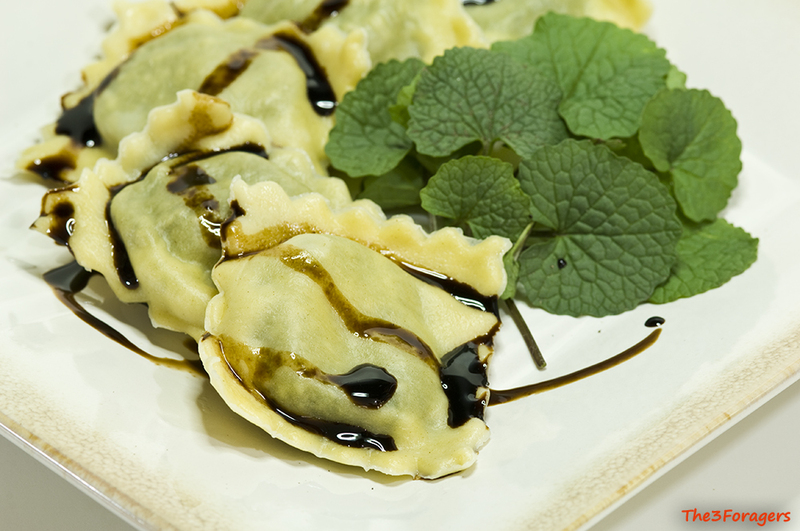 Use the filling to fill ravioli, wonton wrappers, or as a spread. Makes about 2 cups. 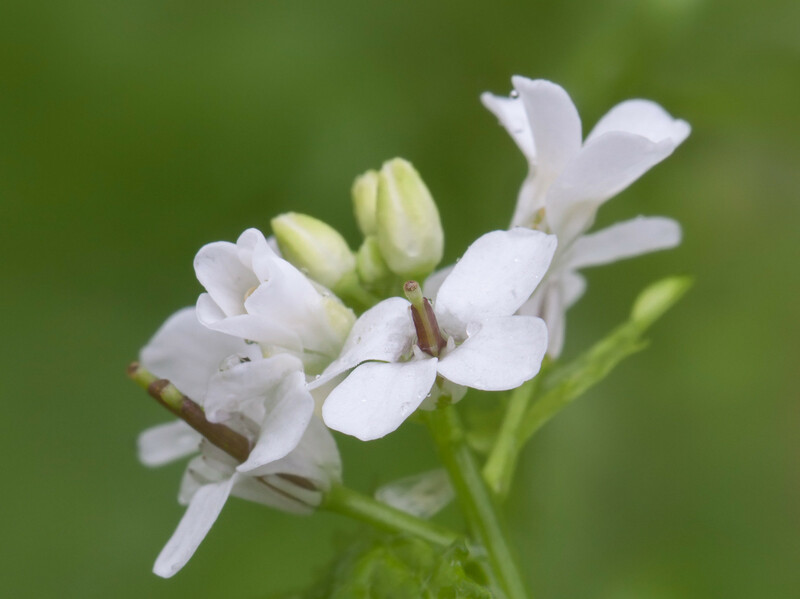 A special thank you to author and ecologist Corinne Duncan and Karen Monger of The 3 Foragers for their content contributions to the Garlic Mustard Introduction. Heat the oven to 375°. Place the greens and chickpeas in a food processor, and blend until chunky. Add the lemon juice, olive oil, spices, flour, baking powder, salt and pepper, and process until a thick, slightly chunky paste forms. You may need to add more olive oil, if you want the mixture to be scoopable. Scoop the mixture into patties, about 2 Tablespoons for each patty. Coat the falafels in the breadcrumbs and place on a baking sheet. Spray the falafels with a light coat of olive oil cooking spray. Bake for 20 minutes, flip over and bake 10 minutes longer. 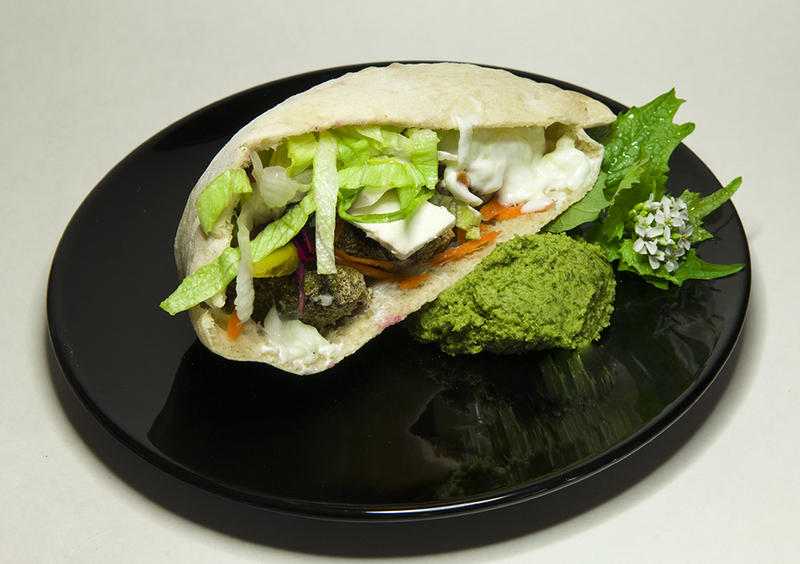 Serve with pitas and fillings. Makes about 35 falafel patties. Place the chopped garlic mustard leaves, ramps greens and chickpeas in a food processor. Process until chunky. Add the remaining ingredients, and process until smooth. 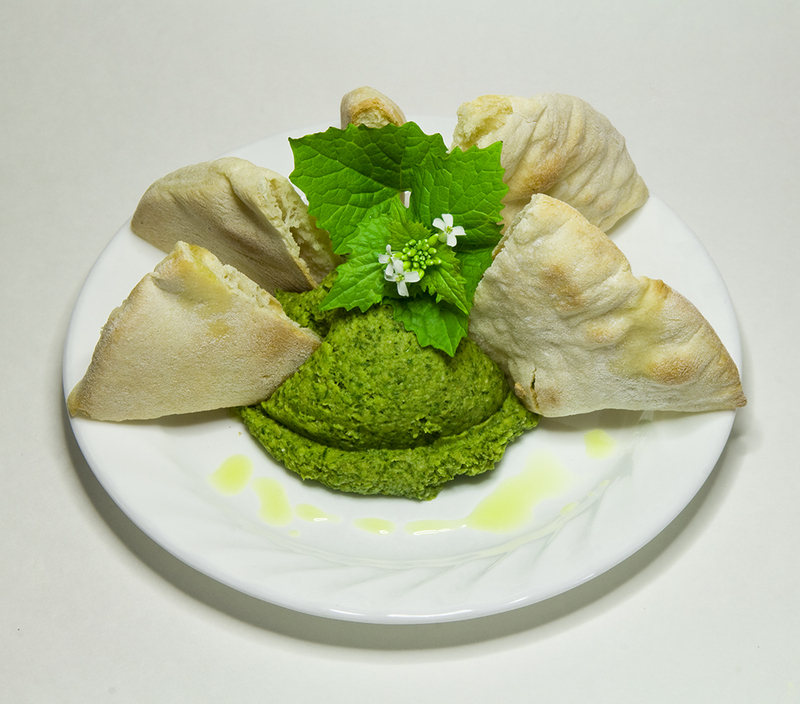 We like our hummus very thick, but you could add more olive oil. Serve with pitas. Makes about 2 1/2 cups.